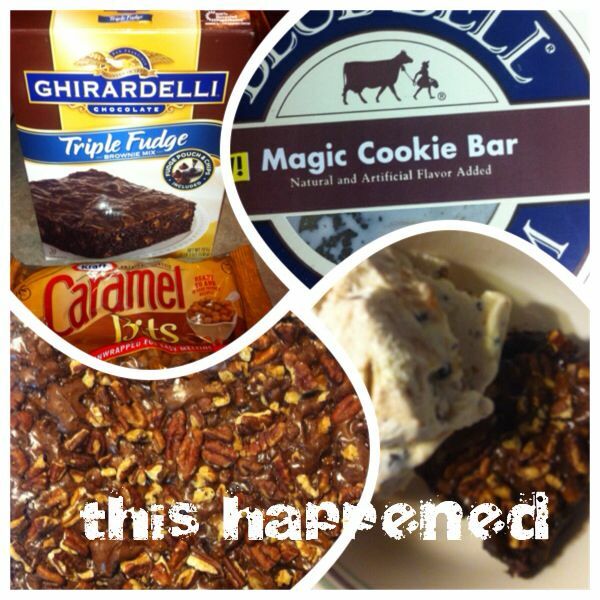 I came up with this idea today….mix up the Ghirardelli brownie mix according to directions, pour the batter in a parchment lined 9X9 or 8X8 pan. Sprinkle a little more than half the bag of caramel bits on top (stir them into the batter a little bit), add some pecan pieces on top, then sprinkle a pinch of coarse salt over all. Bake for 40 minutes at 325 degrees. Cool. Serve with the new Blue Bell “Magic Cookie Bar” ice cream!